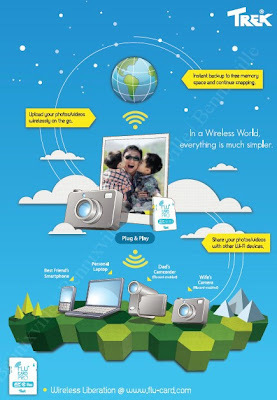 Home Gadget Reviews Trek Flucard Wireless SD Card is coming soon in the Philippines! Trek Flucard Wireless SD Card is coming soon in the Philippines! It was announced since January 2010, that Toshiba and Trek will promote a wireless SD Card called Flucard® Pro a wireless SD card that liberates your photo-taking experience. Besides offering your existing camera the physical storage capacity of a SD card, it transforms the camera into a wireless device, giving a whole new dimension to capturing, storing and sharing your precious moments. Flucard Pro is compatible any devices with a SD host slot with its built in software you can transform your Digi Cam into a Wifi device and enables you to access other Flucard features. Flucard works also on P2P that you can share anywhere, everywhere between Flucard enabled devices. It works on WiFi devices that you can download pictures from your cam to your PC, laptop, tablets and smartphones. With Flucard Pro you can upload your photos wirelessly to Flucard Portal (will be available soon) or any server of your choice. You can share, organize and print photos from the server with up to 2GB free storage. The Flucard Portal comes with instant backup on-the-go to free up space for you new files.